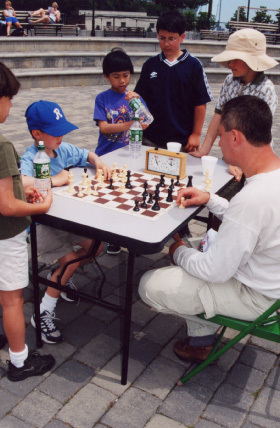 Master Mike plays six children in a simultaneous at The Chess festival held at Sinatra Park in Hoboken. Looking on right to left; James Arsenault, William Alston, unknown child, and Liudmil Liudmilov. Beck, Alston, Arsenault and Liudmilovs combined remarkable State Chess championships record are 43 wins 8 loses and 2 draws, placing in the top 4 each year. Alston has won the top spot once and placed second another time. Beck has won top spot in his grade 3 times. Arsenault has played board 1 for the championship 4 consecutive years. 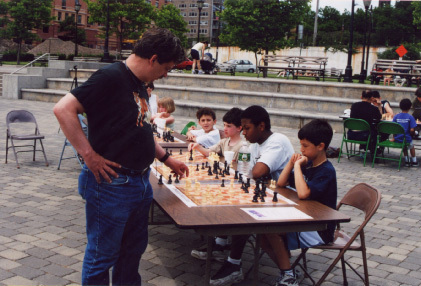 Maxwell from the Hoboken Chess Academy plays Coach Bobby Stewart from the Kings Knights chess club in Jersey City. 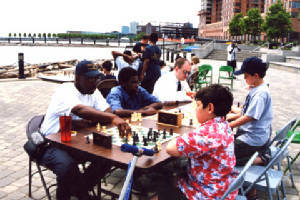 The Hoboken Chess Club will be sponsoring a Chess Festival. Participate in a simultaneous event.